A simple start toward an optimal form for the periodic table would incorporate periodicity in its simplest form which is a circular calendar. Then, it would require that it correlate with an established time model. If it doesn’t, then either the table or the model is incorrect. The alignment would have to follow some sort of geometric pattern. It must be complete, unbroken, holistic, and easy for a child to learn. It should be aesthetically pleasing. The Garden fulfills all of these criteria and more. It also displays the four basic elemental forms broken into a four quadrant toroidal doughnut with each quadrant independently following the fibonacci sequence from the center outward. This would not be possible were it not for the fortuitous discovery that 84 was the number of primordial elements. The four outside “decans” or elements are displayed as separate in all systems. When complete, The Garden also takes on the shape of both a labyrinth, and the universal symbol for Seed. Here’s the kicker. The elements do not simply correlate with the other systems, but in fact perfectly match them in function, personality and order. It all just kinda happened. I didn’t set out to find the optimal form, I just simply used what was natural. It is easily expandable by simply detailing decay chains on a blown up view of the primordial source. Below are the sources and easy to use chart for research. Chart Sources List – Using the sources links will help to view and follow the Chart below. Periodic Table of Elements – The large table partway down the page HERE enables a person to click on the elements individually. They were correlated with these systems using function primarily, but also unique characteristics numerous in variety. If even one is moved it would throw off the entire set. I- Ching – The translation choice is important, just as with the numerous choices of interpretations of many of these systems. The Legge translation on Sacred Archives.com HERE is the one which universally fits the best. It also has very good commentary under the main line descriptions. There is room for improvement but the Chinese have kept good records. Quiche Maya Day Descriptions – Two sources are used. Saq’be HERE and Artstrology HERE. The source on Saq’be is very good, and the descriptions on Artstrology were written down word for word as best I could while being given the descriptions orally through a translator. Don Simeon Takira under request by Don Alejandro Cirilo Perez Oxlaj and translated by Elizabeth Araujo. I have found both sources to be necessary for full understanding. I believe the Decans were recorded by the Maya as well, but as of yet, I have not seen a published set of 36. The 20 days are irrefutably the worlds most valuable set of periodic knowledge. Hindu Decans – The images on Artstrology HERE with descriptions were obtained from a book only available in german. Das Indiche Horoskop, by Marlene Kruger. They correlate very well with the Dendera Zodiac of Egypt. The Zodiac is kind of universal. There are too many sources all with their own faults and truths. Genesis – The information gleened by the correlation leaves no doubts as to the meanings of the stories and the obvious insertions of various things will appear to the trained eye. Things that exist where they don’t belong. The chapters correlate with the Trecenas, Days and Decans. I used the KJV version HERE. Example: Chapter 3 is Ajpu trecena and begins 1 Ajpu, 2 Imox, etc. In the same chapter is the Decans woven into it. 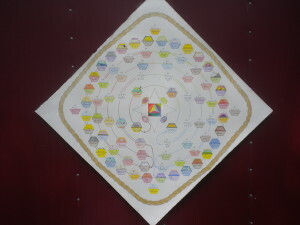 The I-Ching info and Maya info is embedded ver batim. Brings big questions and big answers. Due to the cyclical and periodic nature of the 84 primordial elements, it is natural and fitting that they would in fact precisely correlate with the primordial time keeping systems of multiple cultures. There is a concensus among the Spiritual Elders of these cultures, that indeed the information contained in the various systems listed were derived from a single source. Time is, at its purest form of understanding, fluctuations of energies, and the periodicity associated with such fluctuations. The individual elements of time are easily defined and meticulously identified by multiple techniques , all of which adhere to the scientific process.